We eat fruit out of hand in the summer, juices running down our hands and arms, sticky fingers reaching for more. These fruits are quick-cooking, and we throw them into simple cobblers or pile them, untouched, on light, creamy tarts. They need minimal processing. But when they’re gone—when the last of the peaches fall to the ground and rot; when there’s frost; when all that’s left are green tomatoes, stinted in their ripening—produce becomes confection, because, that makes us feel warm. We like to dress fresh flavors in a saccharine veil. Some folks appreciate the variety of apples at the orchards, pairing heirloom russets or honeycrisps with cheese and packing macs and macouns in lunchboxes. But more often than not, we cover them up. 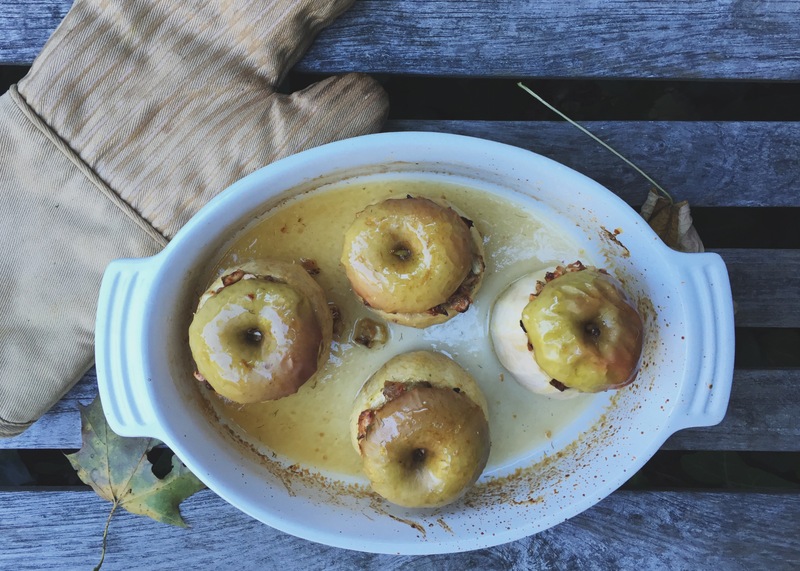 We stew them, toss them into pies, or stick them and dunk them into molten caramel. These are all good and mostly delicious things, but they’re ubiquitous this time of year. Apples are juicy, and their sweet-tart freshness makes the back of your jaw tingle. Pumpkin doesn’t taste like your grandmother’s 20-year-old potpourri, and it is not shaped like a can; it tastes like squash, with a vegetal sweetness. Pears are floral and creamy, not wine-soaked and translucent. So here I present a fall fruit in its original shape, firm enough to have integrity; it requires knife and fork, bringing to mind the snap it had off the tree, but it’s still warm and tender, like a good fall dessert should be. However, unlike many fall desserts, it is not hidden; instead, it hides. 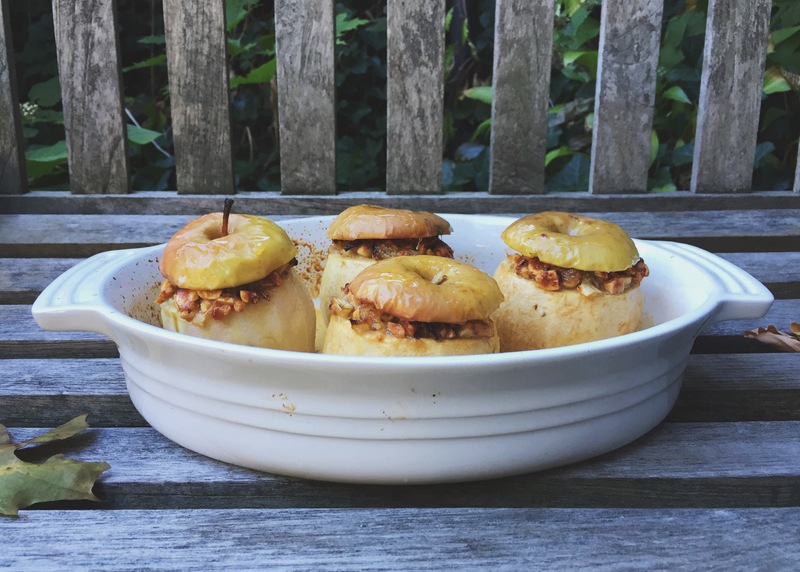 Round orbs hide a sweet-and-pretty-darn-savory browned filling (crunchy roasted peanuts; anise-y fennel; salty, rich Pecorino; a little floral lemon zest; and just enough sugar for caramel notes)—and there’s nary a warm spice in sight. 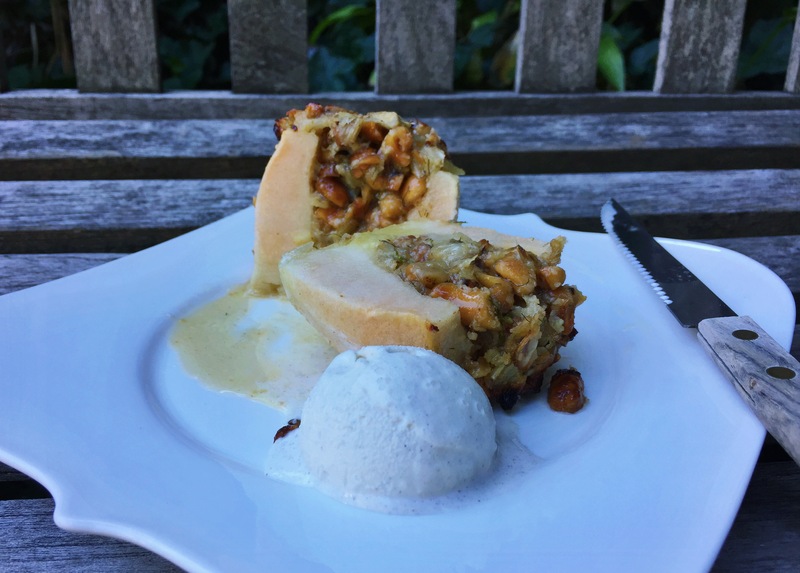 The crowning touch is a white wine caramel sauce made from the cooking liquid, augmented by the apple juices that flow in as the apples bake and soften. While we brace ourselves for the inevitable winter to come, it’s nice to leave something uncovered, to enjoy the fruits of this season in their untouched state and in new ways, paired with other seasonal ingredients but not cloaked with spices. It’s nice to remember that fall is about harvest and that the earth still has special treats for us to savor until it turns to white. 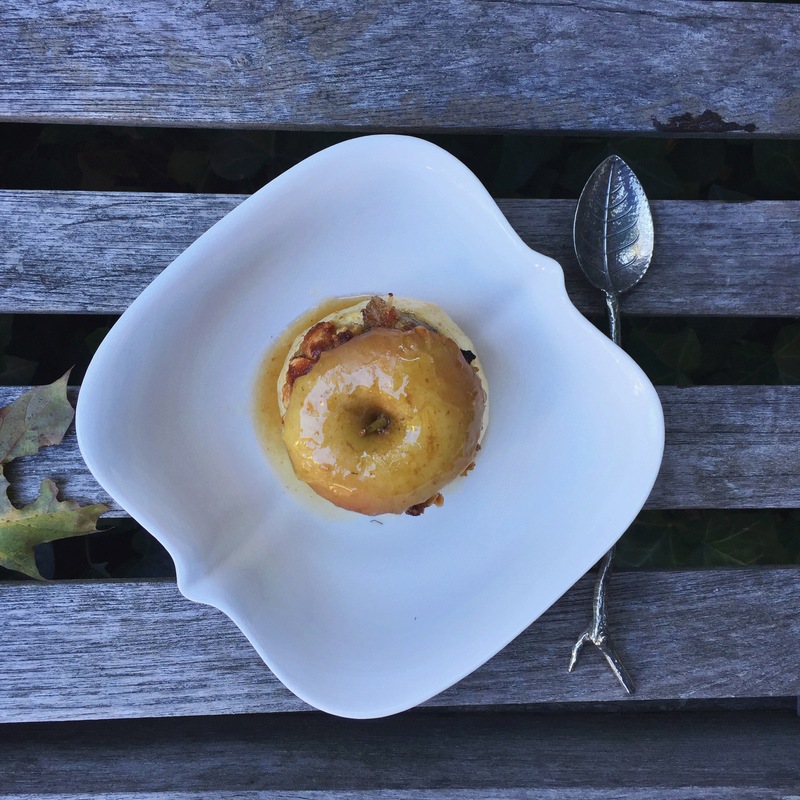 Use a good sweet-tart baking apple for this recipe. Granny Smiths are a bit tart and take away from the filling and Golden Delicious apples are too sweet. I really enjoyed Spencers and Pink Ladies. Fujis or Jonathans also work well. If you can find smaller Mutsu’s (they’re usually huge), they would make great baked apples. Make sure the four apples are similar in weight to each other. 1. Adjust oven rack to middle position and heat oven to 375 degrees. Heat oil in 12-inch nonstick skillet over medium heat. Add fennel, season with salt, and cook, stirring only occasionally, until tender and browned, about 10 minutes. Transfer fennel to bowl and let cool completely. 2. Stir fennel, peanuts, Pecorino, 2 tablespoons plus 2 teaspoons sugar, 21 grams (1½ tablespoons) butter, lemon zest, and fennel fronds until they sticks together; set aside. 3. Cut ½ inch off apple from stem end and blossom end, reserving stem ends. Using melon baller or 1-teaspoon measure, hollow out core of apple, leaving substantial cavity and making sure not to push through bottom of apple. Peel apples. 4. Add remaining butter to medium baking dish, place dish in oven to melt butter. Roll apples in melted butter. Fill apples evenly with fennel mixture, piling filling on top of apples. Add wine and remaining 2 tablespoons sugar to baking dish and whisk together. Add apples to dish. Bake for 30 minutes, basting sides of apples every 10 minutes. Place apple tops on apples and continue to bake until a toothpick can slip into and out of the apples. 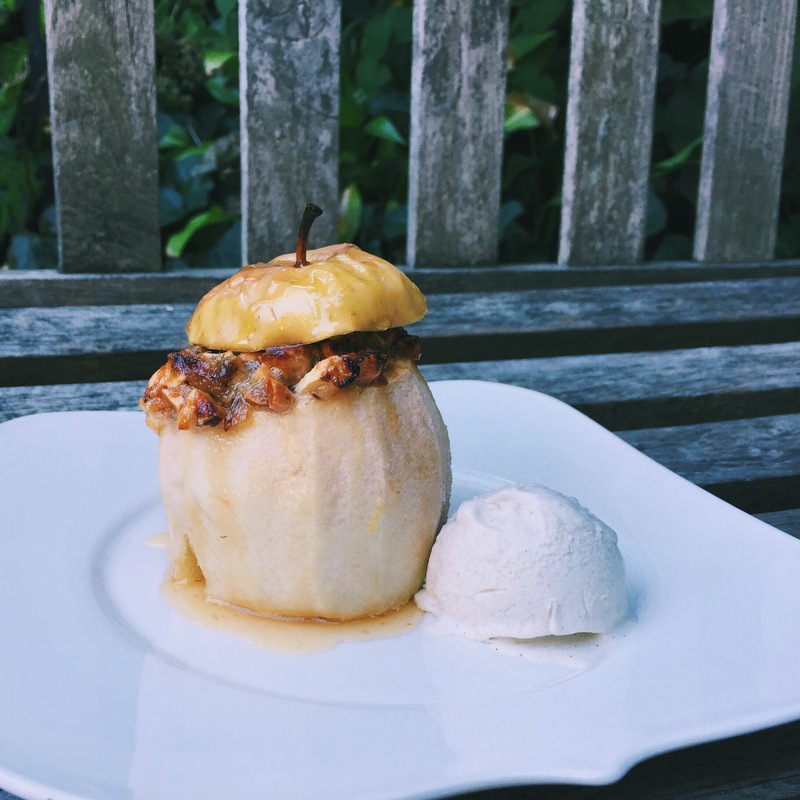 Serve apples with vanilla ice cream and top with wine sauce. Beautiful prose. And, oh, what an interesting recipe. I know just what it tastes like even though I’ve never had anything like it, and wish I had one of those apples right now!